ANNOUNCEMENT: Doodle Pantry is going to be releasing digi images twice a month! Look for a new set of digis on the 20th at Clearly Delightful! First of all, let me apologize for being ridiculously absent here lately. Not only is it summer but for a while there I over-obligated myself with swaps, design team work and of course, we can’t forget about the family! I was working my buns off creating several projects every night so after, my creativity was so long gone and I was hard pressed to stay awake, never mind write blog posts. At least I have TONS to show you as I have taken pictures of virtually everything! I love this lily, do you remember when I coloured it as a Stargazer lily here? Well, I loved it so much, I decided to colour another. This time I coloured it authentically as an Easter Lily. Or at least as authentically as they looked on Google Images! lol! I have to say, Basic Grey’s latest release, Kioshi, has such gorgeous colours that work perfectly with SU! soft subtles papers, some of which are retired. But I still have them all! 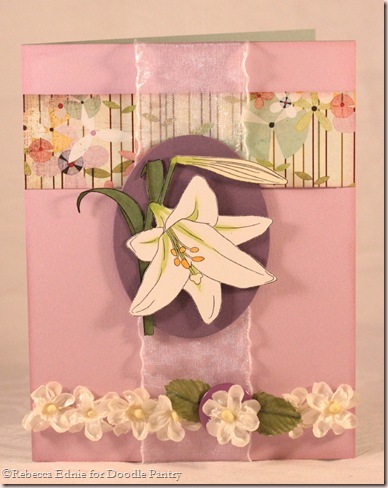 Including pale plum I used for the background of this card. 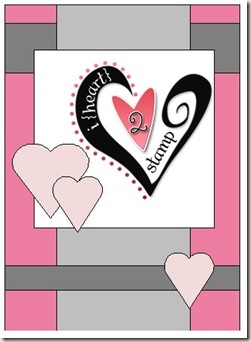 I wish I has embossed or stamped the background but oh well, I still like it. I used Jen delMuro’s Sketch for You to Try from today! YEAH! I actually played a sketch with enough time to not only post it here but to join in the fun on her blog! I don’t know how many times lately that I have made something using a sketch or challenge only to not get it blogged in time! It was fun turning the lower horizontal piece into a flower garland. I used the button to highlight one flower so it would stand out as the focal point shown in the sketch. Previous postOranges Bookmark for Doodle Pantry and a Challenge with Prizes! Ooohh, such a pretty card! I like the color combo and the papers you chose. Also, the row of flower accents! This is such a beautiful creation! Wonderful job.